NOTE: THIS OIL CONTAINS A VARIETY OF SPICE ESSENTIAL OILS THAT MAY PRODUCE A VERY MILD WARMING SENSATION AFTER INITIAL APPLICATION. THE SPICES ARE HIGHLY DILUTED AND SHOULD NOT CAUSE MAJOR DISCOMFORT. THOSE WHO ARE EXTREMELY SENSITIVE TO SPICE OILS MAY WISH TO AVOID THIS BLEND OR PERFORM A PATCH TEST IN A SMALL AREA TO TEST FOR SENSITIVITY. DOES NOT CONTAIN CINNAMON ESSENTIAL OIL, ONLY FRAGRANCE OIL. Sycamore Chai is a handcrafted vanilla chai tea offered in the fall by Sycamore Sugarworks. It is also served at Maplewood Inn, a quaint bed and breakfast in the town of Foxcroft that also carries some of Sycamore Sugarworks' maple delights. Sycamore Chai features notes of cardamom, ginger, tea, vanilla and soft cinnamon. It comes paired with another seasonal specialty offered by the Sugarworks: ginger-pumpkin rolls stuffed with marshmallow creme. The pumpkin rolls are made with pumpkin pulp from the local Gunnerson's pumpkins. Both items are a local favorite served throughout the entire Autumn Festival season. 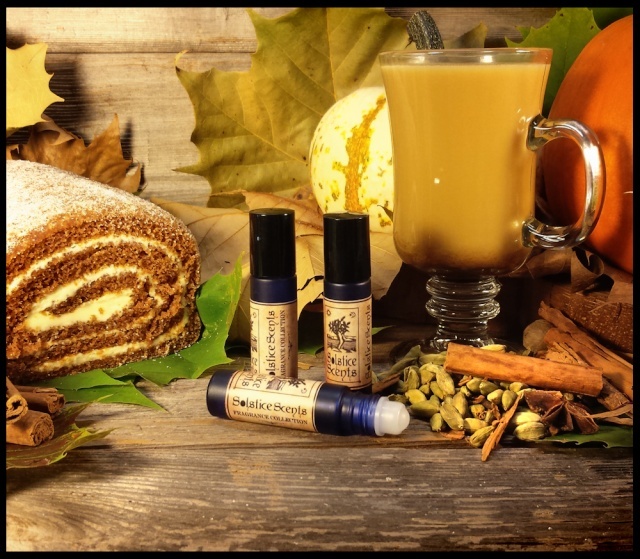 Shake off the chill of the morning and warm up with a hot frothy chai tea and lightly warmed ginger-pumpkin roll! Sycamore Chai is primarily a vanilla chai tea fragrance with a hint of marshmallow creme and pumpkin. The marshmallow becomes stronger after the scent has been on the skin for a while. Sycamore Chai opens with an explosion of cardamom EO, ginger EO, tea and vanilla. The tea blend has a touch of a bergamot note. After a few minutes, the scent becomes sweeter and creamier with notes of cinnamon, clove and pumpkin coming forward. A warm melange of exotic spices swirls around the tea and vanilla notes. A faint whiff of marshmallow creme will start to ebb in occasionally as the scent evolves. This fragrance layers well with Corvin's Apple Fest and would likely layer well with a variety of other fragrances, both gourmand and non-gourmand. I was curious to find out what this second foray into the chai domain was going to be like and am more than absolutely surprised and delighted with what I smell. The tea smell is dominant along with more than a touch of cardamom and ginger. The tea to me is a lovely strong black variety with just the right amount of spices to add interest, but never dominate. Angela demonstrates very deft had at balance in this fragrance, and while the pumpkin roll is hinted at, the pumpkin never dominates the fragrance which to my nose remains about the tea. The underpinning of vanilla is slow to blossom on my skin. I had wondered whether having it described so dominantly in the description might mean that the fragrance turns too sweet on me, but that is not the case at all. On me, the sweetness stays well in check. This is a sophisticated and wonderful addition to the house. The more I wear this, the more comfortable I feel in saying that this is one of Solstice Scents' masterpieces - and I never expected to react this way. Personally I would not layer it as it is an exceptional scent on its own. I had initially wondered if this fragrance was going to be one of the 'variations on a theme" type works, but it is nothing of the kind. It stands proudly as a great fragrance. Straight out of the vial this smells like heaven... like a sweet, spicy, gingerbread. Once it's on my skin it smells much different though. It opens with a burst of cardamom, ginger, and tea. It's really reeeaaally strong at this point. After a bit it softens a little and I mostly smell cardamom, pumpkin, and faint marshmallow. After it's been on for several hours it's mostly just marshmallow with a hint of cardamom. The cardamom in this was really strong for me, I think my skin must amp that note... I could hardly smell anything else. I even dreamed in cardamom that night, if that makes sense. Everything was cardamom. I also got a lot of pumpkin from this, which is a bit strange because it's supposed to have just a hint of pumpkin and marshmallow. I don't really get any vanilla from this. If you like cardamom, definitely give this a shot. This was an unexpected HIT for me! It's a pumpkiny-zingy smell. It smells light and aromatic, not heavy at all. It get smoother as it dries. Could very well be my next bottle purchase! I was a skeptic and I am ashamed. When I anticipated this scent I though it would smell creamy and like the pre-made chai mix you can find on the grocery store shelves. I thought it would be similar to Kitchen, which I do love, but didn't want something too similar. Boy was I wrong! This is a clear, astringent chai tea with a bit of sweetness. I don't really get the marshmallow cream or the pumpkin, but it's lovely anyway and I'm amazed at the quality of this scent! Gorgeous for fall. EDIT: I had to go back and amend my review because I ended up falling in love with Sycamore Chai after all. It seems like my sample just needed some time to settle to allow the spices to blend and mellow out. Once applied it is still very spicy but that gets toned out once the marshmallow and pumpkin come out to add some smoothness. On me this ends up smelling a bit woodsy rather than being mega gourmand. So glad I gave it another shot because it is one of my favorite fragrances now. This smells like a spicy vanilla chai latte with some extra spices from the pumpkin. I love spicy scents and drink at least one cup of chai a day but still found the spice in this to be a bit too strong. It is primarily ginger and I wish the marshmallow creme note was stronger to give it more creaminess. This reminds me a lot of Russian Caravan (same smoky, bitter, astringent black tea and spices going on), but this is sweeter and spicier, with the tea keeping things from getting too sweet. It goes through an initial phase where I always think that this is going to be way too spicy for me, but then it quickly settles down to tangy, milky black tea with slight smokiness, chai spices, and a soft, creamy marshmallow. I get more and more vanilla-creamy-marshmallow as it dries down, leaving me smelling like a chai spice dusted marshmallow with a cup of bitter tea off to the side, which is awesome. Just as yummy as it sounds. At first, it smelled like a warm slice of pumpkin pie with whipped cream, brightened up with a tiny hint of citrus (the bergamot in the chai tea could be it, along with the brightness of the ginger). The spices dominate for the next couple of hours, a warm cinnamon, ginger, and cardamom mix. Then in drydown it becomes mostly vanilla, but a dark, natural vanilla that I really love - the description of it being “frothy” fits well to me, like the smell of a mug freshly drained of vanilla latte (or of course vanilla chai tea). I love this one! Great longevity too: the next morning I can still smell a faint but pleasant whiff of marshmallowy vanilla. I could want more of this!